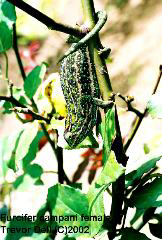 Chamaeleon campani, Chamaeleo octotaeniatus, Chamaeleo campani. 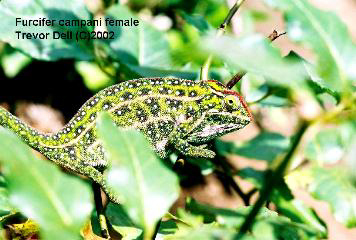 A small chameleon of the lateralis group, F. campani rarely exceeds 5.5 inches in total length. Native to the central plateau of Madagascar, where it inhabits bushes and grass tussocks. Gular and ventral crests are absent but there is a row of enlarged tubercular scales along each side of the vertebral ridge. Rostral processes are absent. A white line runs along the midline of the ventrum. 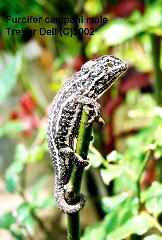 Basic body coloration varies from light green to dark brown and even black. Numerous small, light-colored and even red spots cover the body and three light prominent light bands run horizontally along the flanks. Reproduction is oviparous with a relatively short incubation period of 7-10 weeks. Glaw, F. & M. Vences. 1994. 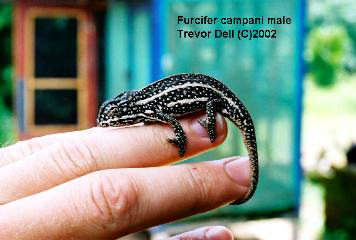 A Fieldguide to the Amphibians and Reptiles of Madagascar. M. Vences and F. Glaw Verlags GbR, Kln.